Facebook is generally regarded as one of the most entertaining social networking sites. However, it has it own advantages and disadvantages. Facebook’s advantages include keeping in touch with long lost friends, playing games and offering many fun applications. The disadvantages include the problem of “Facebook stalking” and theft. Facebook stalking is the ability of a stranger to lookup personal information about another individual and then use that information to commit crimes such as identity theft, harassment and fraud. “Facebook stalking” can lead to disastrous and unfortunate results. Individuals can publish incorrect, defamatory or other negative information on the Web, or use personal or private information to harass someone. Facebook has recently introduced new privacy settings that allow the user more control in determining what information is publicly available and which Facebook friends have access to everything a user publishes on Facebook. One good way to ensure more control over the information you post on your Facebook account is to add only persons you know to your friends list. Verify that a friend request belongs to someone you know personally before confirming them as a friend. If you can’t identify a person who’s issuing a friend request, or do not recognise him or her from your work, school or social circles, do not accept their friend request. If you don’t normally communicate with a person on your friend list, it’s perfectly acceptable to “unfriend” them. Reserve your Facebook friend list for people who are actively involved in your life or who are looking to reconnect. Use the Faceboook privacy settings to lock down your information. Create separate “friend lists” that categorise people according to how you know them. Family may end up on one list, while work associates may end up on another. Before you publish anything, determine which list of people may see your materials. Pictures of a holiday with your family may be inappropriate to share with your colleagues from work. Limit access to your personal information to your friends. If you’re feeling comfortable, you can extend this to “friends of friends.” Do not make all information publicly available, and be sure you know what each Facebook application is asking for. Limit Facebook applications’ ability to publish information about you to others. Information about you, including photographs, documents, and videos, can remain available on the Internet indefinitely. Even if material is removed from the original publication site, cached copies and copies that are downloaded and saved can be republished elsewhere. Some things seemingly take on a life of their own. As the original publisher of your information, you have the most control over who sees it and how it gets distributed, but only at the time you first publish it. Pictures of your latest university escapades may become a severe embarrassment years down the road when a prospective employer is trying to find information about you. Think carefully about what you say, and what you post, and limit access to the most sensitive words and images. Social networking can be a great tool, but it does not mean that all people in your various social circles should have unfettered access to every aspect of your private life. A good rule of thumb is to avoid publishing information that a prospective employer cannot ask on an application form. Give careful thought to publishing information such as your full name, date of birth, address, employment history, or personal details of your medical history, and educational achievements. Periodically review both your friend list and your privacy settings. Ensure that your default privacy settings restrict public access to your information and monitor your friend list to include only those persons you know and trust. 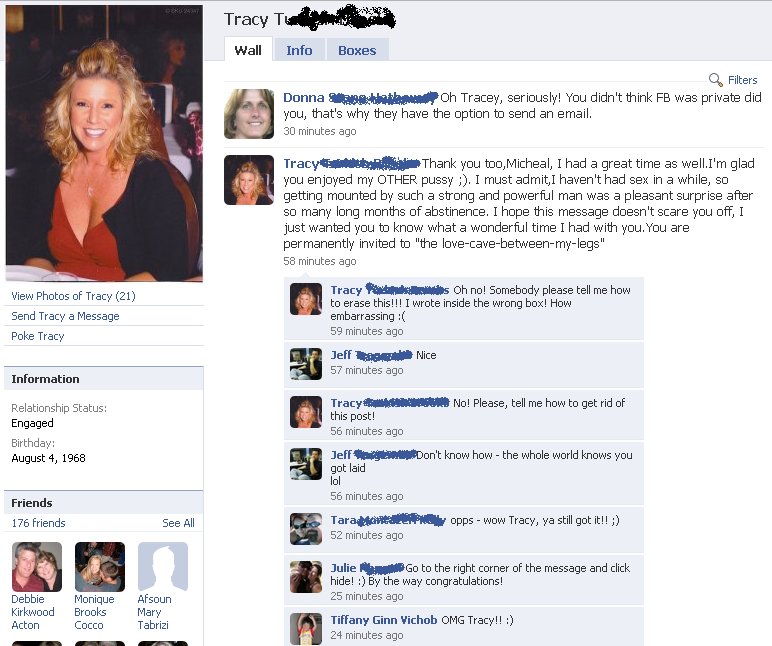 Tracy Turkish Brooks: Facebook profile hacked. Click image below to enlarge and read what was posted on her profile. Some users might find this funny, however it has a serious side to this as well. On this case, Tracy was extremely luck as she had family and friends to rush to her aid and defend her online before major damage was done. However imagine an employer, boyfriend, friends and family would think if this popped up on your profile. From Internet reports online, the root cause of this issue was a hacked hotmail account which enabled the attacker to gain access to her Facebook.